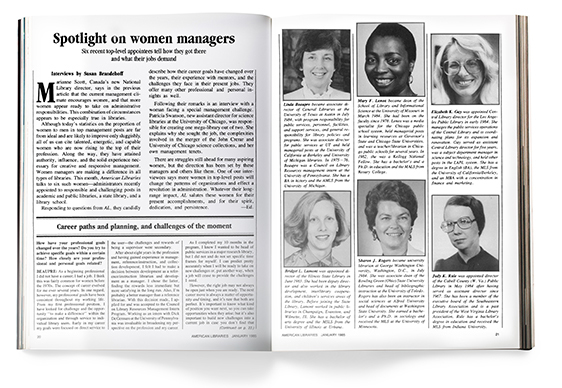 An article titled "Spotlight on Women Managers" that was featured in the January 1985 issue of American Libraries. Thirty years ago, American Libraries published “Spotlight on Women Managers” a series of interviews with several women who had been recently appointed to library management positions about their views of management, their goals and challenges, and their expectations for the future. Recently, we followed up with four of those interview­ees to see how their experiences matched—or didn’t match—their expectations, their observations of the cur­rent state of library management and of women within it, and the lessons they’ve learned over their careers. BRIDGET LAMONT, director of the Illinois State Library from 1983 to 2000, when she joined the Illinois governor’s staff as director of policy. SHARON J. ROGERS, university librarian at George Washington University in Washington, D.C., from 1984 to 1992. She then served as the university’s associate vice president for academic affairs until 1997, and a consultant until 2002. JUDY RULE, director of Cabell County (W.Va.) Public Library since 1984. ELIZABETH (BETTY GAY) TEOMAN, director of Los Angeles Public Library’s Central Library from 1984 to 1998. She then served as director of Rye (N.Y.) Free Reading Room until 2006, and director of Rancho Mirage (Calif.) Pub­lic Library until retiring in 2007. AMERICAN LIBRARIES: What has changed—and what has stayed the same—since your original interview? TEOMAN: In 1985, libraries were learning how to be more strongly involved in the community, and that focus has become only stronger since then. LAMONT: Most of what I said in 1985 I would repeat, even though things didn’t turn out the way I planned in terms of what I thought I would be doing. I have learned to be less concerned with title and more concerned about the effectiveness of the person. Many of the most effective people may not have the “right” title in the hierarchy, but they know how to get things done. Our interviewees agreed that there is a need for special support for new library managers. That need, however, isn’t limited to women. “It’s important for the profession to have both men and women as managers, and both men and women need special training,” Teoman says. ROGERS: The title of the article rather surprised me. I don’t think we would label people as managers these days. The word is now “leaders,” and the change in language indicates a change in role. The other surprise is the way in which academic libraries have changed. When I started, they were firmly parked in the academic affairs strand of an institution. Now they’ve expanded their role as a place on campus, but their placement in the aca­demic organization has floated around—sometimes they’re in the IT channel, sometimes academic affairs, and some­times other places. RULE: I think many of the things I said are still true. I still think men and women have different management styles, gen­erally speaking. Is there anything you learned in your career as a manager that particularly surprised you? TEOMAN: The transition we went through in Los Ange­les was amazing. We had a 1929 historic building that had deteriorated over the years, but in the 1980s there was a sense in the library that we couldn’t get the support to do anything about it. The Community Redevelopment Agency developed a funding plan to expand and modern­ize the library as part of its project to revitalize downtown. Then, there was an arson fire at the Central Library in 1986, and the whole community saw the library threat­ened. People came forward with stories that showed how very personal the library is as an institution. It brought a groundswell of support for libraries citywide, and branch bond issues started passing. The public reaffirmed our responsibility to be the core of the community and we expanded our programs and services to better reflect that. We learned this through the public’s response to an emer­gency, but now you see libraries playing this role all over the country. RULE: Sometimes I’m surprised by how poorly people can act and how the public can mistreat library facilities. But then, on the other hand, I’m surprised by how great our staff and public can be. The innovation, suggestions, and help they offer constantly surprise me. I also became a tad sharper, in the sense of being more attuned to what was around me and what made people operate. I believe a lot in delegating, but sometimes I should have double-checked people in a discreet way to make sure we were on the same wavelength. ROGERS: The repetitive nature of problems that come up surprised me. You never solve something once and for all, because it will come back at you in a slightly different form. That means you can apply what you learned the first time. It’s also surprising the extent to which simple straight­forward skills have a great payoff. For example, I’m good at chairing meetings, and that simple skill had bigger ramifications that got me opportunities. What has changed, either for the better or the worse, for women managers since the original 1985 interview? 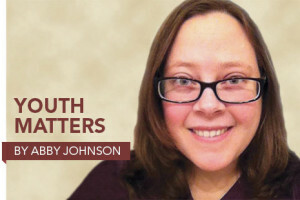 TEOMAN: Many women manag­ers are more educated. Many have gone to get additional degrees and training, which is hugely impor­tant. There’s still sexism in indi­vidual situations, but I see that as more of a one-on-one issue than a broad assumption that women aren’t qualified. There’s an assumption that men and women all have to pull their weight and do their homework. LAMONT: I think women will always have to work harder and will always have to prove themselves—or at least, I think women will always think that. I know women have to pick up other kinds of training to make themselves as effective as they can be. Is management more or less welcoming to women than 30 years ago, and how? RULE: It’s more welcoming than it was. 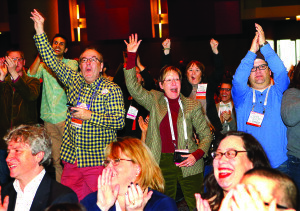 I would love to see the library profession focus on attracting really outstand­ing young people, whether they be women or men, into the profession. TEOMAN: It’s more welcoming, because there’s more training, and no assumption that women aren’t qualified. Has the management of libraries changed in the past three decades as a result of the influence of women managers? TEOMAN: I’ve seen so many different women managers. Some were really strong and some weren’t, some were re­ally collaborative and some weren’t. The importance of leadership is huge, but I don’t think it’s so much of a women’s issue. Women are neither the answer nor the problem. LAMONT: There’s a discussion I’ve had with a lot of women: Do women realize what juggling families and jobs was like 30 years ago, trying to show that everything was okay when something may actually have been falling apart? We tried so hard to show we could do it all, and we didn’t take the opportunity afforded to us as managers to take a little break. We didn’t take an hour in the afternoon to address a personal issue [because we wanted] to avoid appearing weak. We never thought we could do that, and I don’t think we gave ourselves enough credit. ROGERS: I think it’s as much a result of the societal interest in managing through teams that has come into the aca­demic environment and perhaps highlighted skills that women have, rather than the women themselves. The whole atmosphere of how you lead an organization has changed, and societal changes and preferences have enhanced that. What advice would you give to new female library managers— or yourself from 30 years ago? LAMONT: Women managers are so busy taking care of the day-to-day operations of their organizations that they don’t give themselves the opportunity to strategize their next move. I think men are masters at strategizing in their careers and their personal lives, and women managers need to know that it’s okay to do that too—and they need to find ways to do it. Women managers need to be a lot better at promoting themselves, and resilience is a really important skill now being taught. RULE: Working with people is the most challenging part of any job. One of the things I would say is to listen. You learn more when you listen than when you’re talking. Sometimes I still need to remind myself to hush and listen to what­ever’s going on. There are always two sides to anything, and I’ve learned that rather than being so concerned about “right” and “wrong,” to try to be fair to everyone concerned. TEOMAN: Listen more, and work for a lot of different people to get as much exposure to a variety of management experiences as you can. Get out of your comfort zone and force yourself to learn things you don’t know a lot about. Ask about the things you need to fix or improve—it’s really hard for managers to say, “You need to work on this.” And when you’re evaluating people, be carefully candid to get someone to strengthen her weaknesses without damaging her sense of value. ROGERS: I would underscore what I knew at the time: You’re the leader, and you’re the one who needs to be responsible for the big picture of how the organization can interact with its environment. You need to be the big picture person in the organization, because if you’re not, you probably haven’t got one. How closely did the course of your career in the past 30 years follow your professional goals from 30 years ago? RULE: I’m exactly where I wanted to be. I’m content but I hope not complacent. I feel like I still have something to offer this library, this community, and this state. There’s a program in the state, “What’s Next, West Virginia?” to improve the state and its economy. I’m part of the local offshoot, “What’s Next, Huntington?” We’ve seen the population decline turn around since the last census, but we haven’t achieved economic prosperity, so there’s still lots to do. TEOMAN: When I started, I was just looking for a job. My career was so much more than I expected. I had the wonderful experience in Los Angeles with so many chal­lenges, and then the opportunity to go to the Rye (N.Y.) Free Reading Room and work in a small, intimate com­munity before finishing my career in Rancho Mirage. The people I got to know, in addition to the things I got to do, were wonderful surprises. LAMONT: When I left the state library and started work­ing for the governor as director of policy about 15 years ago, I had a very different kind of staff, in that I had my own staff members, each of whom was a strong special­ist in a specific area. They came with incredible experi­ence in their field, and they had clear aspirations for what they wanted to do in the four or eight years that a gover­nor is likely to serve. Working in libraries with the concept of community and trying to give people the in­formation they needed to make good decisions helped me in that position to find and evaluate good ideas. Then, my youngest son got cancer, and after leaving the governor’s office I became a cancer navigator. Having an information background helped me get through those wretched, terrifying six and a half years before Jeff died. ROGERS: I expected to move into higher education ad­ministration. I’m a sociologist in addition to having a degree in libraries, and one of my specialties was complex organization. It was clear the kind of changes that were going to occur in libraries when I finished my doctorate due to the information revolution, and it was clear that if I wanted to influence and participate in that change, work­ing in academic administration would be a way to do that.